Pneumonia may be defined as an inflammation of the substance of the lungs. It is usually caused by bacteria. Clinically it presents as an acute illness characterized in the majority of cases by the presence of cough, purulent sputum and fever together with physical signs or radiological changes compatible with consolidation of the lung. The advent of antibiotics might have been expected to decrease dramatically the mortality from pneumonia. However, mortality statistics obtained from death certificates show the reverse. This is because the dramatic decrease in deaths from pneumonia in children under 10 years has been counterbalanced by an increase in deaths from pneumonia in individuals over the age of 70 years. 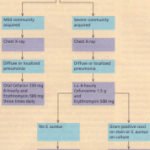 Pneumonia can be classified both anatomically and on the basis of the aetiology. Pneumonias are either localized, e.g. affecting the whole of one lobe, or diffuse, when they primarily affect the lobules of the lung, often in association with the bronchi and bronchioles, a condition referred to as ‘bronchopneumonia’. 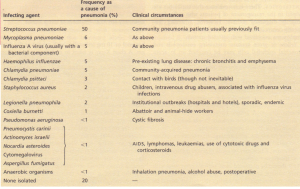 The aetiology of pneumonia in the UK. Mycobacterium tuberculosis is an important cause of pneumonia; it is considered separately, since both its mode of presentation and its treatment are very different from the infective agents. The clinical presentation varies according to the immune state of the patient and the infecting agent. In the commonest type of pneumonia-caused by Strep. 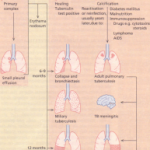 pneumoniae- there is often a preceding history of a viral infection. The patient rapidly becomes more ill with a high temperature (up to 39.5°C) , pleuritic pain and a dry cough. A day or two later, rusry-coloured sputum is produced and at about the same time the patient may develop labial herpes simplex. The patient breathes rapidly and shallowly, the affected side of the chest moves less, and signs of consolidation may be present together with a pleural rub. 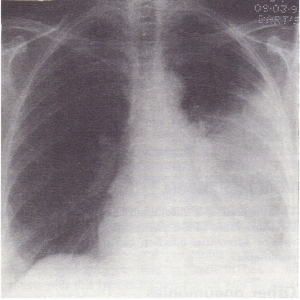 Chest X-ray confirms the area of consolidation but radiological changes lag behind the clinical course so that X-ray changes may be minimal at the start of the illness. Conversely, consolidation may remain on the chest X-ray for several weeks after the patient is clinically cured. 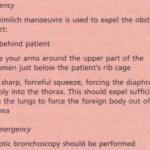 The chest X-ray should always return to normal by 6 weeks, except in patients with severe airflow limitation. Persistent changes on the chest X-ray after this time suggest a bronchial abnormality, usually a carcinoma, with persisting secondary pneumonia. Chest Xrays should rarely be repeated more frequently than at weekly intervals during the acute illness and then at 6 weeks after discharge from hospital. In Strep. pneumoniae pneumonia, there is often a white blood cell count that is greater than 15 x 109jlitre (90% polymorphonuclear leucocytosis) and an erythrocyte sedimentation rate (ESR) greater than 100 mm hour-I. 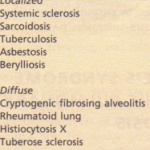 The individual features of different pneumonias are given below. The overall investigation and management is shown and discussed.